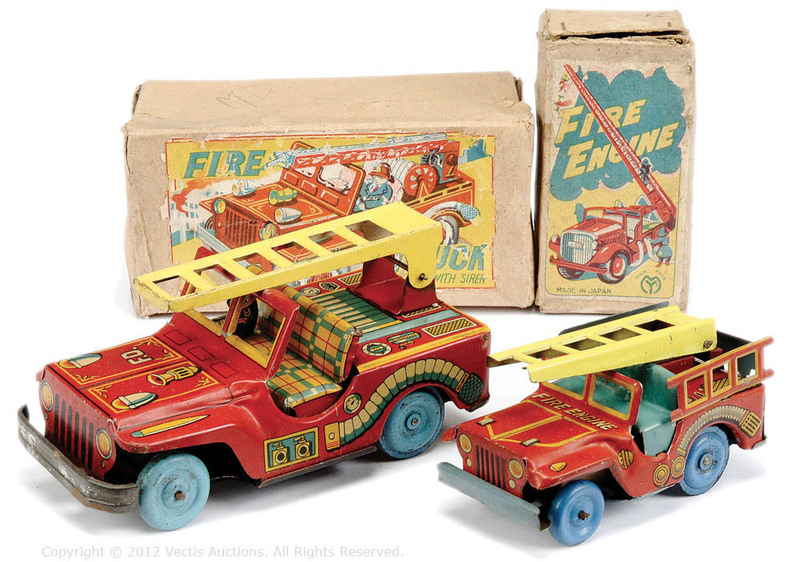 Louis Marx & Co. had been producing its big, metal CJ-2A toy since the 1940's, and all it took to turn the toy into a fire truck, was to paint the windshield red and apply the "V.F.D." lettering that was used on most of the fire engines produced by Marx over the years. The letters apparently stand for "Volunteer Fire Department", since that full name does appear on some Marx toys. Reproductions of the V.F.D. decals are available to restore a worn example like this. See a restored Marx Willys pickup (100K JPEG) with V.F.D. markings. See also a rear view photo (40K JPEG) of the CJ-2A. 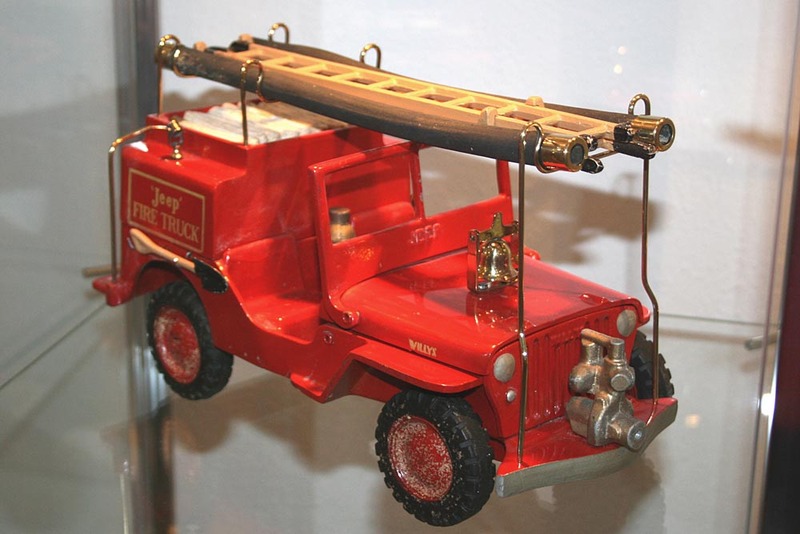 One of the Jeep toys most prized by collectors is this CJ-2A Jeep Fire Truck, from the Al-Toys series cast in aluminum by Toledo Brass in the late 1940's. With realistic extended front and rear bumpers it's nearly a foot long, slightly larger than the Tonka Jeep Pumper produced in the 1960s. 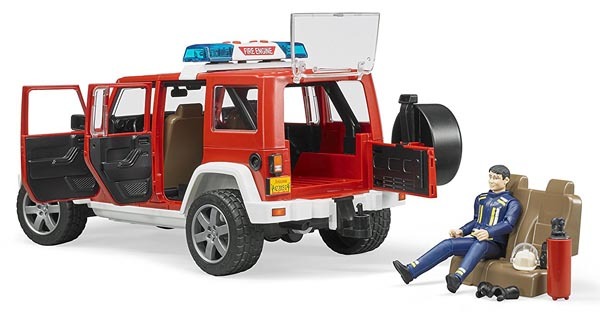 This is probably the most detailed of the Al-Toys, with a front pump, ladder rack, handrail, spotlight, fire extinguisher, and bell all added to the basic body. In addition to the ladder and the suction hose which can attach to the pump, the toy came with accessories including a roll of hose for the hose bed, and a shovel. The photo is courtesy of Jim Marski's Historic Civilian Jeeps Collection. 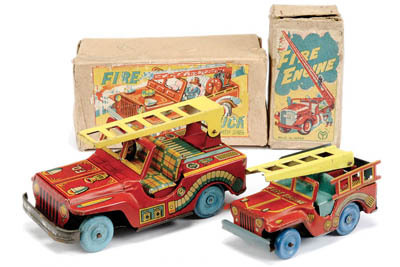 There is a nice Al-Toy Jeep Fire Truck (110K JPEG) in the collection of the Chrysler Museum in Michigan. See also a mint example in an Al-Toy Jeep Collection. These tinplate fire engines from Japan are smaller -- approximately 4 and 6 inches long. 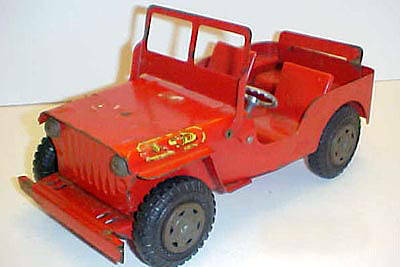 Details such as the siren and the suction hose mounted on the side, are nice examples of Tinplate Lithography on Jeep Toys. And check out the plaid seats in the larger of the two. This "Bomberos" (fire department) Jeep from Spain is a recycling by Rico of their Jeep tow truck toy, which was also sold as a military version in camouflage, as well as a yellow "Popcross" wrecker. Thanks to Juan Manuel Yeste Cortes for the photo. Like many of the fire Jeeps seen here, this is more a fanciful toy than a model that reflects a real prototype. I hope that some of the manufacturers will take a look at the full-size Fire Service Jeeps on CJ3B.info, and get inspired. Also from Spain is this Jeep Bomberos made by Guisval, who also have a yellow Renegade and a military version in their line. Comes with a one-peseta coin (dated 1975) in the package for scale; the toy is about 4 inches (10 cm) long. In a similar scale, this 1950 Joyax tinplate set from France totals about 10 inches (25 cm) long with trailer. 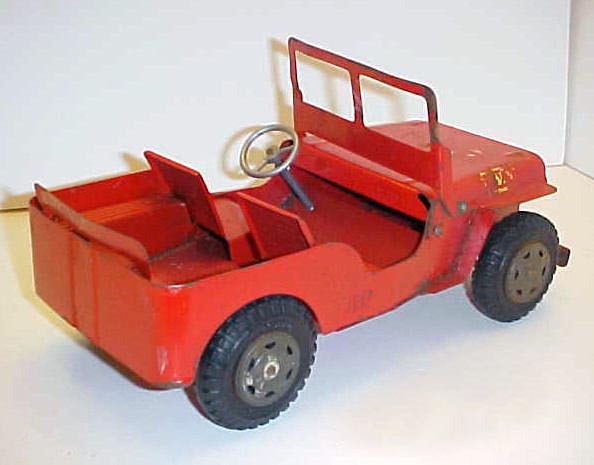 See also Early Jeep Toys Made in France for more examples of Les Jeep Pompiers. 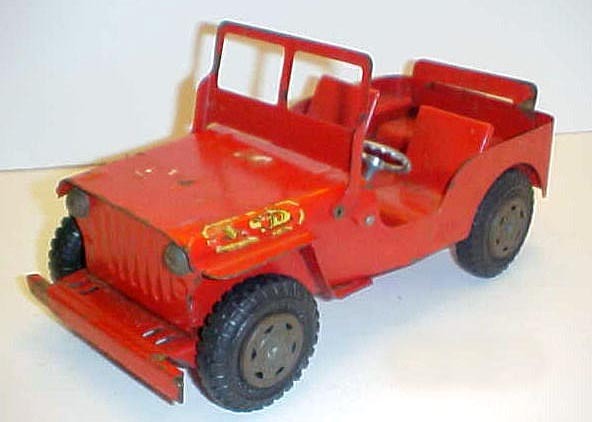 The smallest fire Jeep toy I know of is this version of Roco's HO-scale CJ-5 from Austria. "Vigil del Fuoco" is a 1/43 diecast produced by Mebetoys of Italy in 1974. Mebetoys produced diecasts beginning in 1966, and became a subsiduary of Mattel in 1970. This photo was taken by Jarek Skonieczny, who comments that the model seems to be largely based on the M170 as opposed to the more common CJ-6. There are military blackout lights in the rear, and a pick and a shovel where the tailgate would be on a CJ-6. The split windshield has vacuum wipers on the top, but the front blackout light and the larger passenger-side door opening of the M170 are missing. Jarek also says, "It would be interesting to see how the blue emergency light holds up on the soft top, while driving over some rough terrain to put out brush fires." See also a photo by J-C Guerry of a Carabinieri (Italian police) version of the Mebetoys model (60K JPEG). "Feuerwehr" is printed on the hood of this 1/64 CJ-7, apparently a Made in China toy destined for sale in Germany, and photographed by Mike Albright. 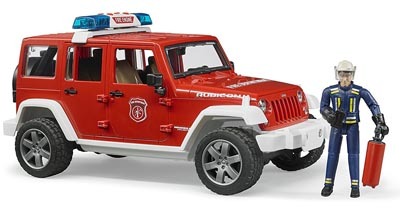 A similar Jeep is included in a dollar-store Fire Vehicles Playset (100K JPEG). Pete Pearson photographed this Corgi Limited Edition 1:43 scale M151 fire tender and water trailer, on the way to a brushfire call. The model carries a Texaco star on the hood (40K JPEG), but is it likely that an M151 MUTT was used by an oil company as a fire fighting vehicle? The M151s retired by the U.S. military were considered unsafe for civilian on-road use, and many were cut in half in an effort to prevent such use. See also the Corgi packaging (50K JPEG). In a big 1/16 scale, this JK Unlimited is manufactured by the family firm Bruder Toys in Germany. Their plastic toys combine realism and durability, which is probably why they are priced at over US$50 in 2018. The Jeep has opening doors and removable roof, as well as buttons on the light bar for sound effects. Plus an Arizona plate! Maisto released a brushfire version of their plastic 1/18-scale Rubicon TJ in 2005. The Maisto Rubicon was sold in yellow as well as red. Details include opening hood and a chainsaw in the rear. See also some prototype Fire Service Wranglers on CJ3B.info. As of 2002, Majorette, the French company now merged with Solido, has a Fire Rescue version of their reliable 1/56 CJ-5 casting. It's created by means of adding a plastic ladder clipped to the roll bar, and a paint job similar to that recently put on the Majorette SJ Cherokee. 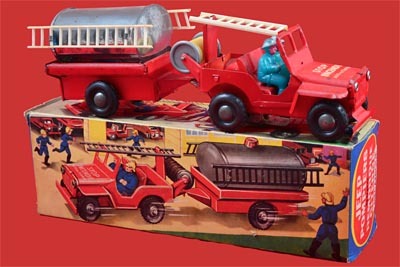 Majorette released a "Fire Dept." version of their larger CJ-5 in 1998. Marked as 1/46 scale, it appears by rough measurement to be closer to 1/36. Manufactured in Thailand, it comes in a set with two plastic figures. See a front view photo (40K JPEG). A recent toy made in China has a working flasher and siren, activated by the yellow button on the roof. It's also available in a police version (70K JPEG). 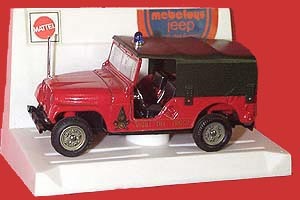 One of many Wranglers from Greenlight Collectibles, this French Fire Dept. 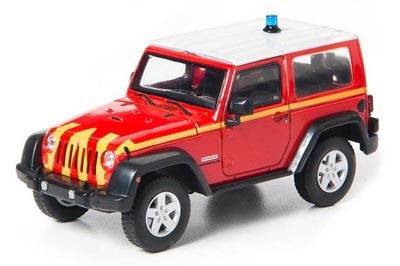 Jeep is a 1/43 model from 2012. See more Fire Service Jeeps Toys.